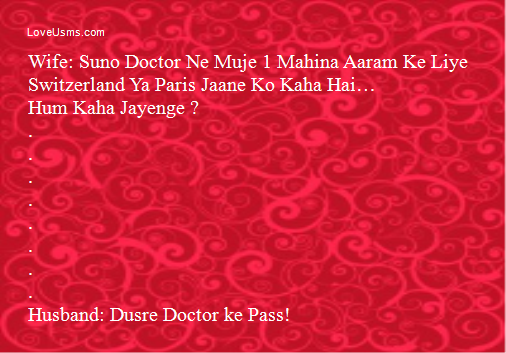 Husband: Dusre Doctor ke Pass! Wife Came in a New Dress & Asked Him: Main Kaisi Lag Rahi Hu ?? 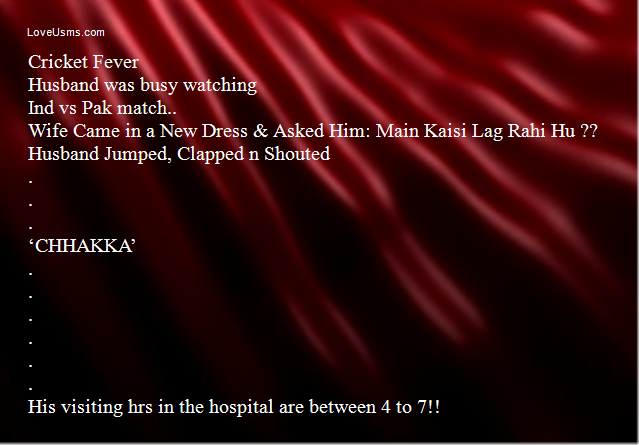 His visiting hrs in the hospital are between 4 to 7!! 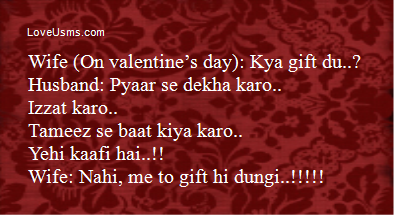 Wife (On valentine’s day): Kya gift du..? Husband: Pyaar se dekha karo..
Tameez se baat kiya karo.. Wife: Nahi, me to gift hi dungi..!!!!! Only a Man understands another Man..
Shopkeeper- Sir, wife ke liye chahiye ya Branded dikhaun.. Wife (angrily)- I don’t believe this… u forgot my birthday again?? How can you do this..
Husband- how can you expect me to remember your birthday when u never look older.. Husband in his mind (sahi time pe dialogue aa gya beta…warna khatam tha tu aaj.. Height Of Disappointment For any Man. And Receives SMS From Wife. Pati patni so rahe the!! Der raat patni ke mobile ki ghanti baji!! Aur kya boli.. chasama lagake dekho..! !